Miguel is a character in the 3D Universe who appears as a supporting role in Grand Theft Auto III (set in 2001) and as a minor character in Grand Theft Auto: Liberty City Stories (set in 1998). He is a prominent member of the Colombian Cartel and is involved in the gang's narcotics trade. 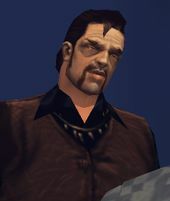 In GTA III he is voiced by Al Espinosa, who has also appeared in such programs as Law & Order, but the voice actor for his appearance in GTA Liberty City Stories is uncredited. Miguel was born in Colombia and moved to Liberty City sometime before 1998, joining the Colombian Cartel, and eventually becoming a prominent drug dealer for the gang. He frequently sold drugs from Portland Harbor to the Leone Family and met Toni Cipriani in a deal in 1998 that was later ambushed by the Liberty City Police Department. Toni Cipriani seemingly kills Miguel, who manages to survive. He continued to climb the ranks of the Cartel and, following the death of Cisco and an unnamed leader, became one of the gang's most prominent members. Miguel and Catalina during the mission Cutting the Grass. In 2001 he met Catalina and Claude as they arrived in the city and helped them rob a bank and escapes the police with Catalina, after she shot Claude and left him for dead. Catalina and Miguel begin to increase the gang's influence in the city by stepping up the production of the drug SPANK from a freighter in Portland Harbor and also begin to work against the Leone Family, exchanging Leone secrets for SPANK with barman Curly Bob. Their operations, however, are stopped by Claude who, on orders from Don Salvatore Leone, kills Curly Bob and then destroys the freighter containing the SPANK factory. Claude, after moving to Staunton Island, begins to work for Donald Love, first rescuing the Old Oriental Gentleman from the Cartel. Love later sends Claude to collect a package from an incoming plane at Francis International Airport and later has him return to collect the real package, having previously sent Claude to collect decoy packages. The package, however, has already been collected by Miguel and Catalina. Claude goes to a construction site in Fort Staunton and confronts Miguel and Catalina. Miguel hands the package to Claude but is shot by Catalina, who jumps down into a skip to escape. Asuka Kasen, enraged following the death of her brother Kenji at the hands of a "Cartel assassin" (really Claude disguised as a Cartel member), begins to torture Miguel for information on the Cartels operations. After extracting information from Miguel, Asuka then sent Claude to stop the Cartel operations, which includes killing three Cartel hit squads, destroy the Kappa Coffee House stands (which were a front to sell SPANK) and destroying a plane and collecting the SPANK packages inside. After collecting the SPANK packages, Claude returns to the construction site and finds Miguel dead, impaled on a construction pole, with a note addressed to Claude attached to his body. Miguel is the only character who appears and seemingly dies in more than one game (GTA III and GTA Liberty City Stories). Miguel bears a similar appearance to Claude, as shown when Asuka Kasen accuses Miguel of being the Cartel assassin that killed her brother, while at the same time stating that she saw the Cartel assassin. Game art of Miguel in GTA III. Miguel in his final form in GTA III. 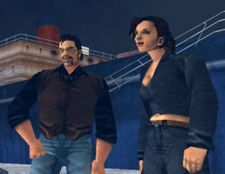 A preview screenshot of GTA Liberty City Stories for the PSP originally depicts Miguel as being the same as GTA III. Miguel in his final form in GTA Liberty City Stories during "Contra-Banned". This page was last modified on 21 January 2014, at 23:41.